The Aussie is currently on course to finishing 2017 as a net winner. But as you can see in the overlay of AUD pairs below, the Aussie’s price action looks rather chaotic on first glance. We do get a cleaner picture if we simply exclude AUD/NZD and AUD/CAD from the overlay of AUD pairs, however. And while we’re at it, let’s also include gold’s price action on the overlay of AUD pairs. As you can see above, AUD pairs took a lot of directional cues from gold prices. And if you’re baffled as to why the Aussie is positively correlated to gold prices, then maybe you missed out (or forgot about) our School’s lessons on How Gold Affects AUD/USD and The Forex Trader’s Guide to the Australian Economy. But as marked in the chart below, there were very noticeable instances when the positive correlation between Aussie pairs and gold weakened substantially or even became inverse (i.e. gold rises but AUD pairs broadly fall). So, why did the Aussie decouple from gold prices? Well, we can thank iron ore prices for that. As you probably know (or not), gold isn’t really Australia’s main export (only 9% of total exports). Australia’s main commodity export is actually iron ore, which accounts for around 24% of Australia’s total exports. In fact, Australia is the biggest exporter of iron ore on the planet, exporting around 58% of the total global supply, based on 2016 data compiled and analyzed by the Massachusetts Institute of Technology’s (MIT) Observatory of Economic Complexity. Also, most of those iron ore exports make their way to China since China’s share of total iron ore imports is a whopping 71%. With that said, iron ore took a really hard hit between mid-March and mid-April and then again between May and mid-June. And as marked on the chart below, iron ore and gold diverged very substantially during the said periods and it looks like Aussie pairs were taking more directional cues from the slump in iron ore price rather than the rise gold in gold. Gold was encountering buyers back then because the Greenback tanked in the wake of the Fed’s March 15 rate hike since the market was none too pleased to find out that the Fed did not upgrade its forecasts for the path of the Fed Funds Rate. You see, the Fed launched a hawkish media blitz in the runup to the March FOMC statement, which primed the market for both a March rate hike and raised expectations that the Fed will communicate that there will be more rate hikes to come. That didn’t happen, which caused the Greenback to rise while pushing gold prices higher. Other commodities such as iron ore should theoretically benefit from a weaker U.S. dollar as well. After all, globally-traded commodities are usually priced in U.S. dollars, so a weaker Greenback means that commodities become relatively cheaper, especially if the buyer has other currencies on hand. However, base metals were in decline at the time, particularly between mid-March and mid-April, due to growing worries that Trump’s fiscal stimulus plans would get delayed because of the political drama involving Trump and then-FBI director Comey, as well as the Republican Party’s failed attempts to challenge Obamacare at the time. You see, other than tax reform and The Great Wall of Trump, Trump also wanted a $1 trillion infrastructure program, which would obviously mean more demand for basic materials, including base metals like steel and iron. And since Trump’s agenda was in doubt, traders who loaded up on commodities began to doubt their positions as well, convincing some to unwind their positions. However, iron ore, in particular, got a really severe beat-down between mid-March and mid-April and that was due to a fear that China won’t be importing iron ore as much since Chinese iron ore stockpiles reached a record high of 132.5 million tons in March, which nursed the idea that the iron ore market may already be oversupplied. At the same time, the Chinese government was trying to curb the Chinese property market, which means less demand for steel and iron ore.
And iron ore would then continue to bleed out until the end of June because China also began cracking down on steel mills that failed to meet pollution standards. In fact, the crackdown on steel mills was cited as the main reason why Chinese imports fell to 1 and ½ year lows, according to a Reuters report. Iron ore has recovered since then, though, with speculation that demand will pick up again mid-March 2018 being cited as a reason since Chinese steel mills are expected to ramp up operations. The Aussie will very likely continue to take directional cues from gold and iron ore. And if you’ve been following Pip Diddy’s weekly and daily recaps, then you probably know that the Aussie has been taking more directional hints from gold lately after taking directional cues mainly from iron ore prices during the earlier half of the year. Gold’s future price action is a bit uncertain, however, since gold’s rise in 2017 has been fueled largely by USD weakness rather than safe-haven demand, given the prevalence of risk-taking in 2017. So if USD strengthens, then that would likely put a black eye on both gold and the Aussie. However, the Aussie has also been taking directional cues from iron ore as well. And as noted earlier, iron ore has been rising on speculation that demand will pick up again mid-March 2018 as Chinese steel mills ramp up their output after the Chinese government limited their output (or shut them down outright) to comply with pollution-related regulations in 2017. Another thing going for iron ore is that the passage of the U.S. tax reform bill will likely embolden Trump to push for his growth-oriented agenda. And that may stoke demand for commodities, especially if Trump starts pushing for his planned $1 trillion infrastructure program again. But on a more downbeat note, analysts polled by Reuters are of the opinion that China’s economic growth will slow “as measures to curb rising housing prices and efforts to deal with debt risks gain more traction,” as Reuters puts it. So if there are signs of weakening growth in China, then that may make traders wary of loading up on commodities. Although it’s still possible that demand for commodities, iron ore in particular, will pick up if Chinese steel mills show signs of higher demand, despite weakness in other aspects of the Chinese economy. As you may have noticed (or not), we haven’t really touched upon the RBA’s effect on the Aussie’s price action. And that’s because rhetoric from RBA officials only had a noticeable effect on the Aussie’s short-term price action. From a “bigger picture” perspective, the Aussie’s price action mostly boils down to how gold and/or iron ore fared, likely because the RBA maintained its neutral stance for the most part of the year while refraining from providing any forward guidance on the future direction of monetary policy. However, there is one very noticeable instance when neither gold nor iron ore could account for the Aussie’s price action, as marked on the chart below. As you can see, gold was tilting to the upside while iron ore surged during the month of November. However, ALL Aussie pairs were sliding lower at the time. 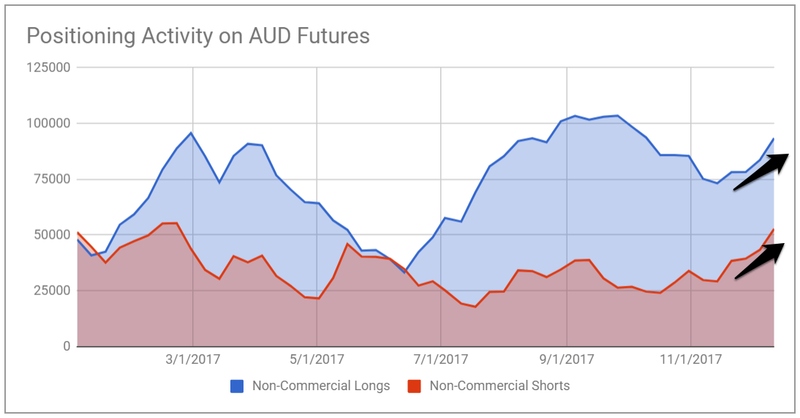 And looking at the COT report, we can see that large players were trimming their long positions on AUD futures while adding to their short positions. And from the looks of it, Australia’s September period retail trade report, which was released on November 3, was the culprit since the year-on-year reading of 2.0% was the weakest reading since October 2008 when the annual reading also came in at 2.0%, which also happened to be a shared record low (at the time). Anyhow, this may be an early hint that Australian economic data and the RBA’s monetary policy will be in play and may have a bigger role on the Aussie’s price action next year. 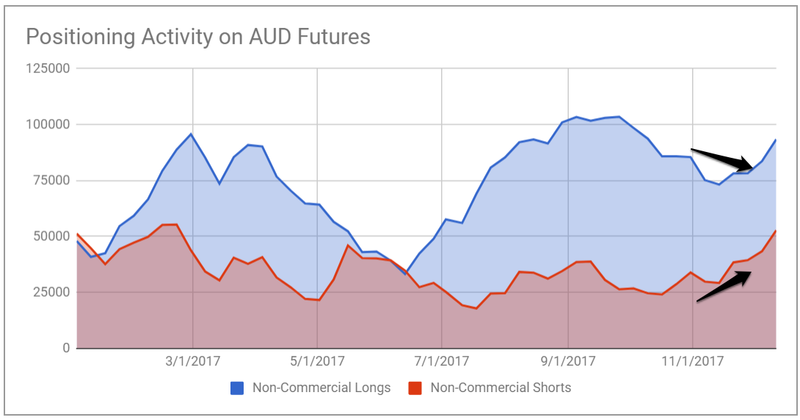 If we take a look at the COT report again, we can see that both AUD bulls and AUD bears have been adding to their respective bets since late November. 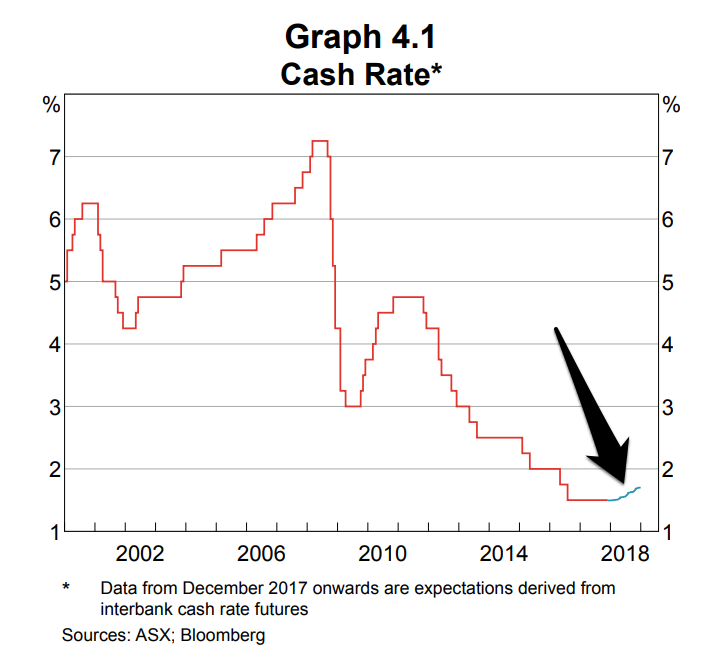 Also, the RBA’s November Statement on Monetary Policy showed that if the Australian economy continues to evolve within expectations, then we may see a rate hike sometime in the middle of next year, which is likely why bulls have been reinforcing their positions. Although it’s also possible that the increase in AUD long contracts shows speculative position on the expectation that demand for commodities will pick up next year. Bears for their part, have a reason to be bearish because Australia’s October retail sales report revealed only a 1.6% year-on-year increase in retail trade turnover, which is the weakest ever on record and a poor sign for domestic demand. And as mentioned earlier, some analysts think that China’s economic growth will slow down in 2018, which will adversely affect Australia’s exports since most of Australia’s exports go to China. Anyhow, since both sides are building up their respective positions, one side has to give sooner or later. And that would hopefully mean strong directional movement next year. What do you think? Will the RBA and economic data play a bigger role on AUD’s price action next year or will AUD pairs continue to take directional cues mainly from gold and iron ore? And between the two commodities, which do you think will the Aussie pay more attention to?